These spots are Chicago classics. Chicago’s Dog House If imitation is the highest form of flattery, Hot Doug’s Doug Sohn must be blushing. The friendly recent college grads running the show at this hot-dog shop serve picture-perfect Chicago-style dogs and hand-dipped corn dogs along with a rotating menu of franks with cheeky names like the Blago (“Opening bid: $1,000”) and the Snoop Dogg. Specialty sausages are hit-or-miss (the rib-eye steak dog was nearly swallowed inside a French roll), but if it’s time—not duck fat—you value, consider this a viable wait-free alternative to Doug’s. 816 W Fullerton Ave (773-248-3647). El: Brown, Purple (rush hrs), Red to Fullerton. Bus: 8, 11, 74. 11am–10pm. Average hot dog: $4. Gene & Jude’s Red Hot Stand Don’t ask for ketchup. That’s the first rule of ordering one of the snappy hot dogs (topped, as always, with fries) that this SRO institution has been serving since 1951. Claim your place at the end of the perpetually long line and entertain yourself by watching the surly types behind the counter cut potatoes and fry them into perfect greasy strips. Once it’s your turn, order your dog with everything, then count your blessings for the wax paper–wrapped bliss that lies before you. Huey’s Hotdogs It’s hard not to like a mustard- and ketchup-hued hot-dog joint with its own foosball table and a menu of artery cloggers named for the owner’s family members. Throw caution to the wind and go for Kali’s Killer chili cheese dog or Pokey’s grilled Polish with all the trimmings (and a free side of fries to boot). The menu also offers a smattering of sandwiches and some salads, but why bother? A dog and one of Huey’s thick “rockstar” milkshakes are the best way we can think of to load up on nitrates and saturated fat. Jimmy’s Red Hots Like Gene & Jude’s, Jimmy’s is a purist’s hot-dog stand: no seating, no char-anything, and for crissakes, no ketchup. 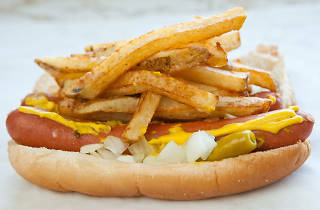 You’ll find nothing but tasty Vienna Beef hot dogs and Polishes served on steamed buns and rolled into paper with greasy, hand-cut fries. As a consolation for the much-maligned ketchup lover, Jimmy’s sells a decent housemade habanero hot sauce to dip your fries in, or to pour on your “supreme tamale.” Want some entertainment with those dogs? Go late at night, which is the best time to catch sketchy parking-lot antics. Murphy’s Red Hots You can’t walk a dozen blocks in this town without bumping into a Chicago-style hot dog, so what’s so special about this one? We think it’s owner Bill Murphy, who takes a lot of pride in greeting regulars and walking new customers through their orders (this man clearly loves his job). Polish sausages and Italian beef are on offer, but we keep it sweet and simple with a red hot, grilled and dragged through the garden, with a side of hand-cut, skin-on fries, dropped in bubbling oil only when you order them to ensure freshness. 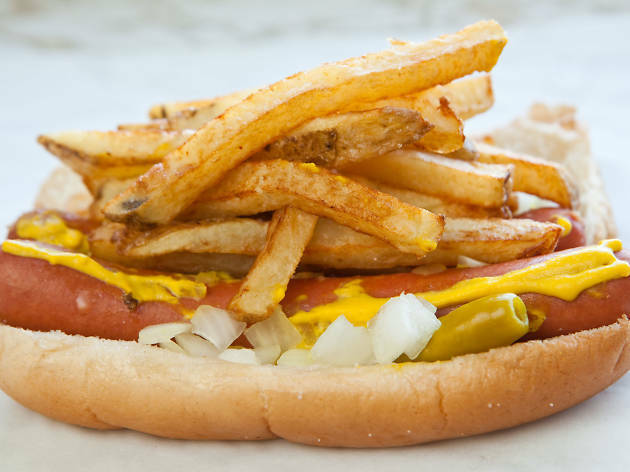 Wolfy’s In the pantheon of Chicago hot-dog stands, Wolfy’s deserves a seat on the dais. The room is sparkling clean and the staff is sweet—think of it as the anti–Wieners Circle. Though it offers a lot more, take a cue from the iconic signage that features an impaled hot dog on a sparkling fork and stick to the sausages. The Vienna Beef chargrilled Polish is near-perfect, but it’s Wolfy’s hot dog, one of the best in the city, that will make even the most jaded hot-dog eater smile.